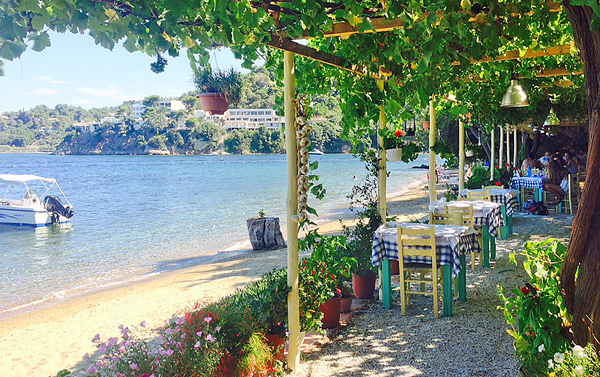 Skiathos proved a revelation for our Acting Assistant Editor Melissa this summer. 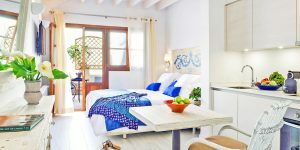 Chosen on a whim, its combination of cool bars, authentic food and countless sandy beaches (plus a couple of great-value i-escape hideaways!) has earned it the title of her new favourite beach holiday destination. 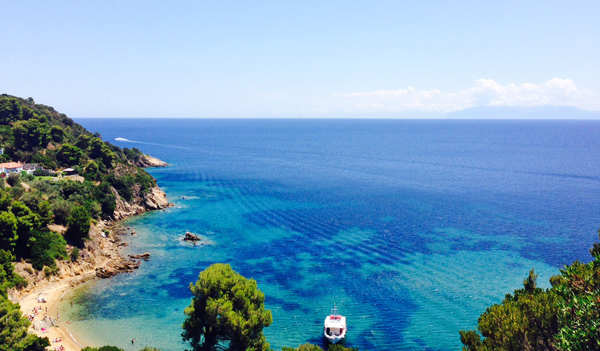 Here, she talks us through her week on this blissful Greek island. 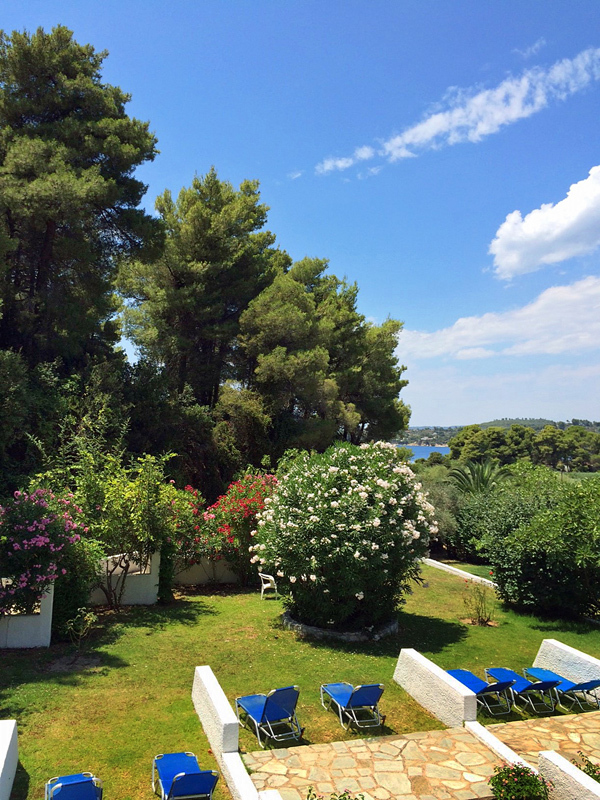 Ah Skiathos… Need I say more? Well, probably, because if (like me, 2 months ago) you know little about this 12km-long island, there certainly is a lot to tell. Let’s go back to June. Summer was marching on and we were keen to enjoy the UK heatwave. Unfortunately, the pesky matter of full-time employment kept placing itself squarely between us and a week of sunbathing at home. Thus, a holiday was in order. 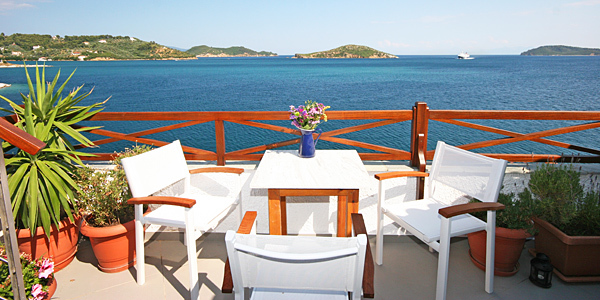 While settling into our airy (and bargainous) Standard Studio, we quickly spotted the deep blue sea beyond the trees. 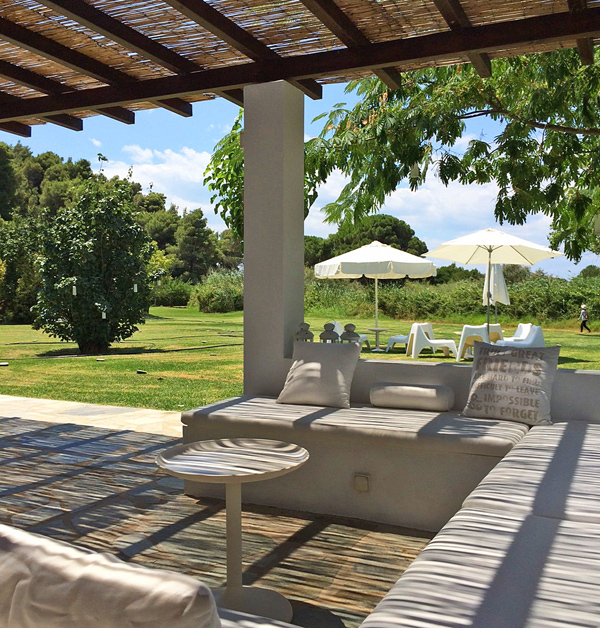 Moments later, we were wandering out of the lawned garden and directly onto Vromolinos Beach. It really is that close. 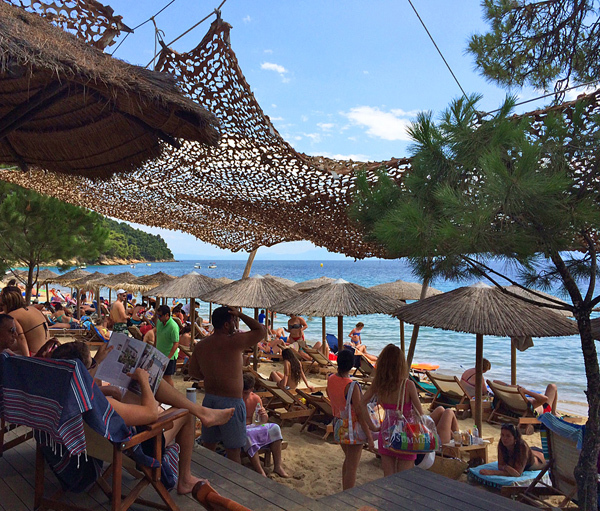 Walking in the sun-warmed shallows, we followed the chilled-out sounds emanating from Porto Paradiso beach bar. Maybe it was the enticing cocktails and comfy sunbeds, or maybe it was the fact that we hadn’t slept in nearly 24 hours (thank you 7am flight from Stansted), but we genuinely were deliriously happy to arrive at this super-cool hangout. 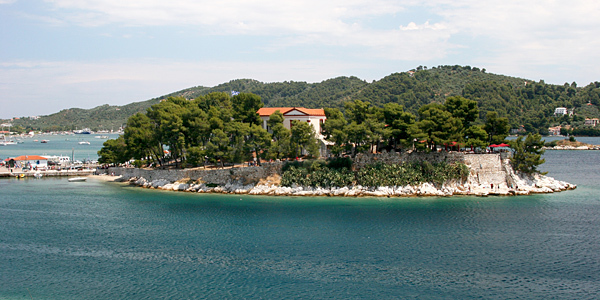 The next day, well rested, we set out to find Skiathos Town. (No need for a car: the island’s excellent bus service tours the length of the south coast.) 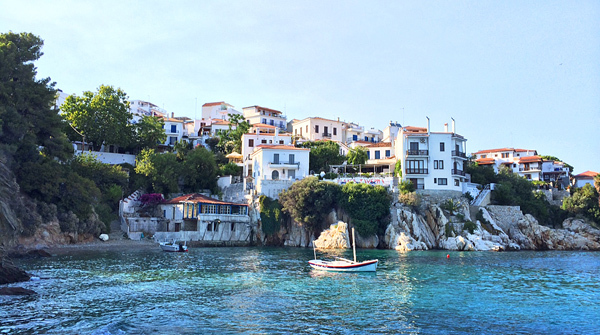 This white-washed harbour-centric settlement is the closest thing Skiathos has to an urban centre, but rest assured there’s not a high-rise in sight – just pretty waterfront tavernas, cubic villas stacked up the hill, and pine-scented Bourtzi jutting out between the old and new ports. We couldn’t resist exploring this little islet and were delighted with what we found: another super-chic and wonderfully relaxed bar overlooking the glistening turquoise sea – there was even a rocky outcrop for pre-lunch swimming. Later, between feasting on bargain gyros at No Name and sipping fabulous herb-laden cocktails at Ergon (best Mojito we’ve ever tasted), we went in search of one of i-escape’s newest additions: Koula’s House, a great-value hideaway with wraparound sea views that’s well hidden in a sleepy corner of town, just steps from the vibrant waterfront. By mid-week we were so relaxed we no longer felt the need to plan our day’s activities. Instead, we were taking leisurely picnic-style breakfasts on the balcony – fresh bread from the supermarket (5 minutes away) and delicious jams from aforementioned Ergon’s deli section – before ambling aimlessly in the sunshine. One day, we wandered the peninsula on which Skiathos Holidays sits, clambering down a dusty gorge to reach this heavenly hidden beach, named Koutsouri. Here we spend a few hours concentrating on the very important tasks of paddling, sunbathing and stacking colourful pebbles found the shallows. Of course, Greek salad is a must in a place like this – Bourtzi’s eatery does a fabulous rendition – and, unsurprisingly, seafood is also a local highlight. 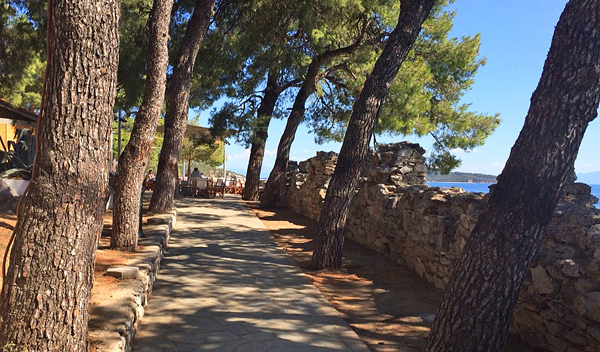 The prettiest setting we found for such a feast was Taverna Sklithri (1 bus stop from Vromolinos Beach). 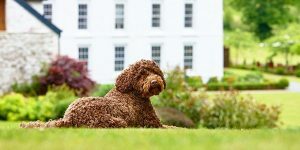 It stands almost entirely alone, on a tiny beach concealed from the road by trees and greenery, but descend the terracotta path and you’ll realise it’s a destination in its own right. Grape vines shade gingham-clothed tables and rainbow-hued chairs, and a few more trail along the sand, inches from the lapping waves – the fresh fish is outstanding. Come at dusk for pink skies­­ or later to watch the orange moon rise out of the inky-black sea. Before we knew it our final day had arrived. 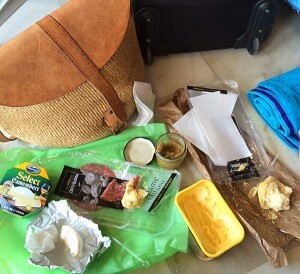 When all else fails and you have to accept that no, on this occasion you cannot simply stay and live in Skiathos forever, we recommend an airport picnic to soften the blow. After some mild confusion at security over the olive tapenade, we tucked into tasty cheese, salami and bread while all those around us despondently nibbled stale baguettes from the airport’s lone café. Yes, we looked ridiculous and had to use a plastic teaspoon as a knife, but this final flourish really helped maintain the holiday mood until the very last moment. 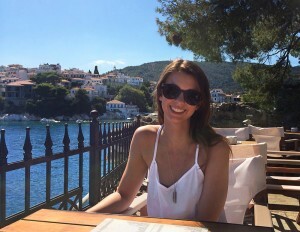 My particular experience of Skiathos was all about relaxation – gorgeous beaches, tasty food and fabulous cocktails – but rest assured there is plenty for the more actively inclined to explore here. Check out our destination guide for more info.